Make a double batch of this easy fruity frozen yogurt and keep half in the freezer for a fabulous standby dessert. Using a cherry stoner or small, sharp knife, remove the stones from the cherries. Place the cherries in a food processor with the yogurt, orange zest and juice, icing sugar and kirsch, if using. Whizz until smooth, then pour the mixture into a freezerproof container with a lid. Freeze for approximately 2 hours, or until the mixture begins to freeze around the edges. Break up the mixture using a fork, and stir until smooth. Repeat the process a second time, then return to the freezer for a final 1-2 hours until firm. Remove the frozen yogurt from the freezer 20 minutes before serving to allow it to soften slightly. 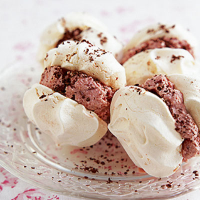 Sandwich scoops between two meringue shells and sprinkle with the grated chocolate or a dusting of cocoa to serve. Try full fat Greek yogurt for a creamier texture. If making for children, omit the kirsch and pour the mixture into lolly moulds before freezing. You can make this dessert with canned or bottled cherries, if fresh cherries are not available.